Not a lot of people know that Egypt is not only famous for its ancient monuments, culture and revolution, but it is also famous for its great food. Egyptian food is a mixture of all the different civilizations that came to Egypt in the history of its existence. Nowhere in the world will you be able to taste so many cultures in one plate. Below is a list of the most delicious and popular dishes served up in Egypt today. 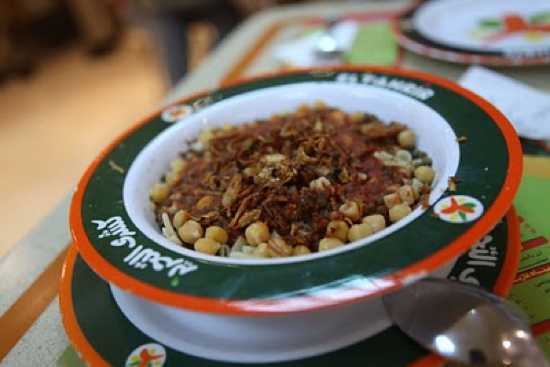 Considered to be the Egyptian national dish, it consists of pasta and tomato sauce, among other items, including rice, lentils, caramelized onions, garlic and chickpeas. Having four sources of carbohydrates has made it the most popular lunch item in most common food outlets in Egypt for over 100 years. Interestingly enough, Kushari’s origins are not Egyptian at all, in fact it was a dish brought in by the British army in Egypt in the 19th century: the pasta was imported from Italy, the tomatoes are from Latin America and the rice from Asia, however the idea to mix them all together in one extremely delicious and vegetarian dish was conceived in Egypt. One of the common staple foods in Egypt, it consists of lava beans served with oil, garlic and lemon juice. 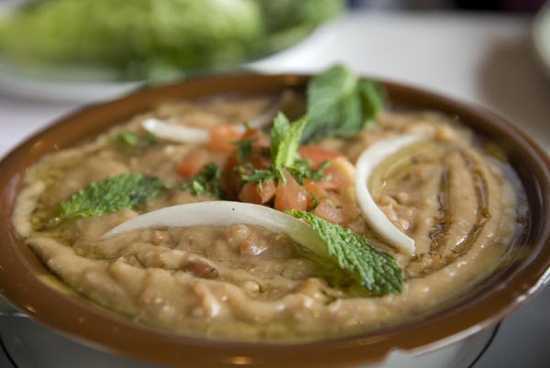 Ful Medames can be traced to Pharaonic roots, and quantities have been found in the Twelfth dynasty. The word “Medames” is Coptic for “buried” which refers to the way it was initially cooked: in a pot buried in hot coal or sand. Ful Medames can be served with many embellishments such as butter, tomato sauce, tahini, fried or boiled eggs and pastrami. However, the most traditional method is to eat it plain and salted in an Egyptian bread bun. Nowadays, Ful Medames is exported to many Middle Eastern countries such as Syria, Lebanon, Saudi Arabia and Sudan. Considered a Nubian dish, fatta is usually prepared for festivities such as a woman’s first birth, and both Christian and Muslim holiday celebrations. It consists of layers of rice and fried bread, covered in a garlic and vinegar meat soup. Large chunks of stewed beef and deep-fried poached eggs are usually served along with the rice and bread base. As you can presume, Fatta is a really fattening dish, with an extremely high calorific value; it is rarely eaten during the year, except after a major religious fast such as the 50 days before Easter for Coptic Christians, or the month of Ramadan before Eid-Al-Futr. 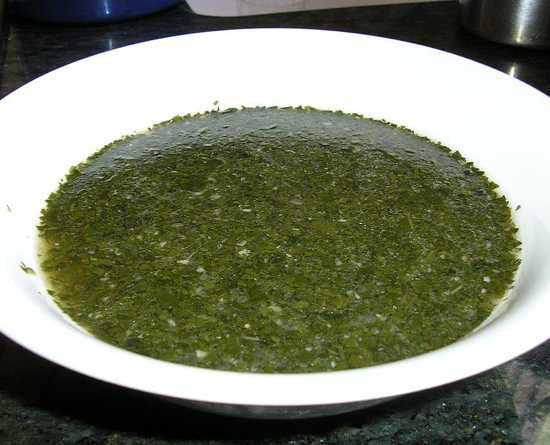 Mulukhiya is made from the leaves of jute and corchorus plants that grow in east and north Africa. 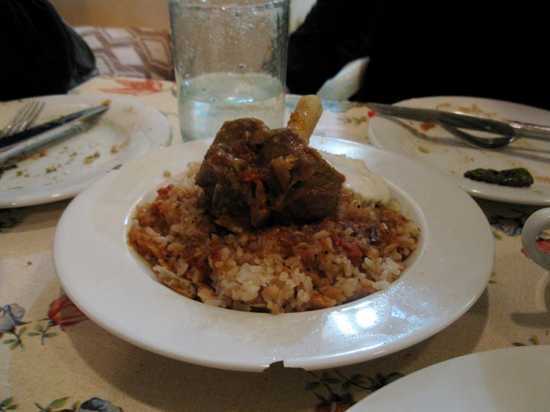 In Egypt, Mulukhiya is prepared by chopping the leaves with garlic and coriander and cooking it in an animal stock such as chicken, beef or rabbit, and served with Egyptian bread or rice. Interestingly, different cities in Egypt prepare it in different ways, for example fish or shrimp are used as bases for the broth in coastal cities such as Alexandria and Port Said. During the late Tenth century, the dish was banned by the Fatimid Caliph Al Hakim Bi-Amr Allah, while the ban was lifted, religious sects such as the Druze still refuse to eat the dish in respect for the late Caliph. Feseekh is a traditional Egyptian dish served only during the Sham-El-Nessim festival, which is a spring celebration with Pharaonic origins. It consists of fermented, salted and dried gray mullet. 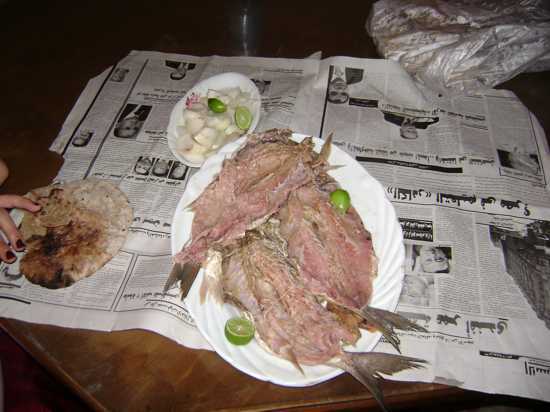 The process to prepare it, which involves drying the fish in the sun then salting it, is usually prepared by a specialized person called a fasakhani. Due to the way it is prepared, Feseekh can cause poisoning if it is prepared incorrectly. It is usually stored in thick glass jars that are firmly closed, as it has a very pungent smell. It is usually served with Egyptian bread, diced onions and lots of lemons. Halawa is a middle-eastern food common across all countries in the Mediterranean. Halawa is made from sesame paste and is available in all shapes and forms: blocks, hair Halawa, energy bars and spreads. 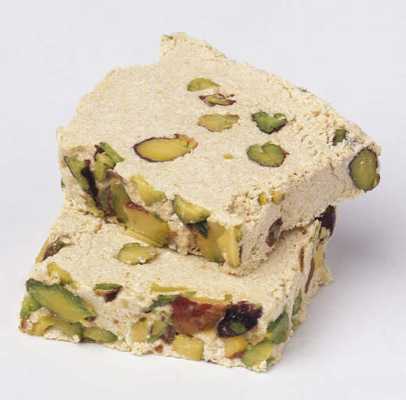 It is sometimes infused with other types of food to add to its flavor, these include: pistachios, pine nuts and almonds. It is a common staple food among Egyptians and it is eaten as a snack or for breakfast and dinner. Halawa can be used as a main ingredient in many other dishes, among those is the Sakalans, which is mixture of Halawa, honey and whipped cream. Interestingly, Halawa is one of the few foods that can tolerate the hot Egyptian weather without going bad, and it doesn’t need any special storage conditions. Dukkah is an Egyptian food commonly used as a dip and eaten along with Egyptian flatbread or raw vegetables, such as tomatoes or cucumber, as an hors d’oeuvre or side dish. It consists of a mixture of herbs, nuts and spices such as mint, salt, sesame, coriander and cumin. 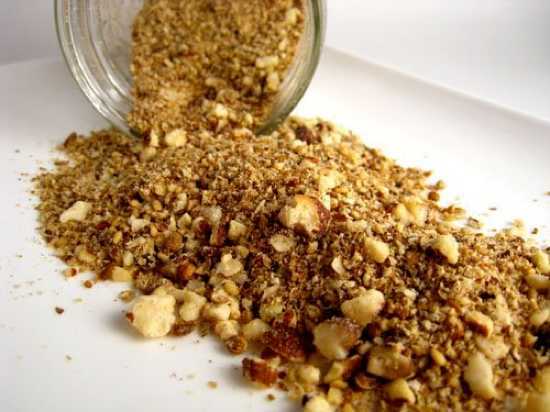 Dukkah is usually prepared at home and each family has a different twist to the recipe, but it is also sold at spice vendors in small paper cones. The name “Dukkah” is derived from the Arabic word “to pound” referring to how all the spices are pounded together to prepare the dish. Outside of Egypt, the dish is rarely known but it has found some popularity in Australia. 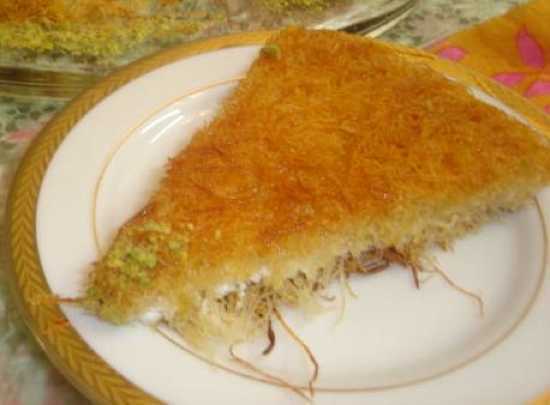 Konafah is an Egyptian sweet made of a very thin noodle-like pastry. The origins of Konafah are very mysterious, its presence has been recorded in Arab medieval cookbooks in both Egypt and the Levant and Turkey, but its exact origins have always been unknown. Konafah is made by drizzling long rows of the thin noodles in their liquid state on a hot plate until they become dry and more rigid. The now-rigid noodles are then mixed with butter or oil and wrapped around a filling made out of nuts, whipped cream or both. It is baked and presented with a fruit syrup on top. 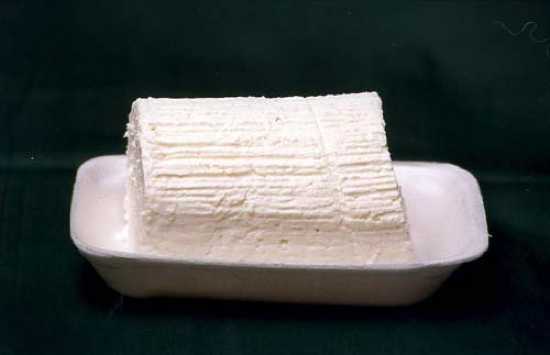 Gibna Domiati is a white soft cheese made in the city of Damietta, in the north of Egypt. It is typically made from buffalo milk but sometimes cow milk is added to the mixture as well. It is the most common cheese found in Egypt and is incorporated into a lot of dishes, such as sambousak (fried thin pastry stuffed with cheese) or mesh (a tomato and cheese dip). Gibna Domiati is aged for a period of 1-3 years in large tin cans, before being eaten. Most Egyptian families take pride in the number of cans they have stored and for how long. In fact, it is said that the more the cheese is aged, the more delicious it becomes.